Yarrow is a wild herb that has also been domesticated for today's gardens. While the wild flowers are white, the domestic varieties come in several colors. It grows throughout my horse pasture. It's one of the first plants to begin growing in the spring, and it blooms all summer long. The leaves and flowers can be dried for use. I try to always have some handy since it's such a versatile and beneficial herb. 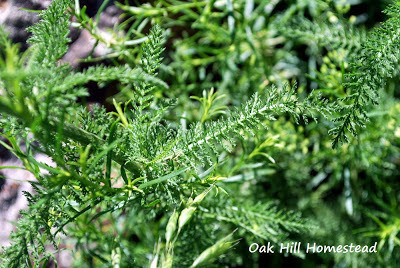 Yarrow is easily recognized by its ferny, feathery foliage. It was the first herb I learned to recognize and use. The leaves will staunch bleeding when applied to a wound, rather like nature's bandage, and are antimicrobial and pain-relieving. 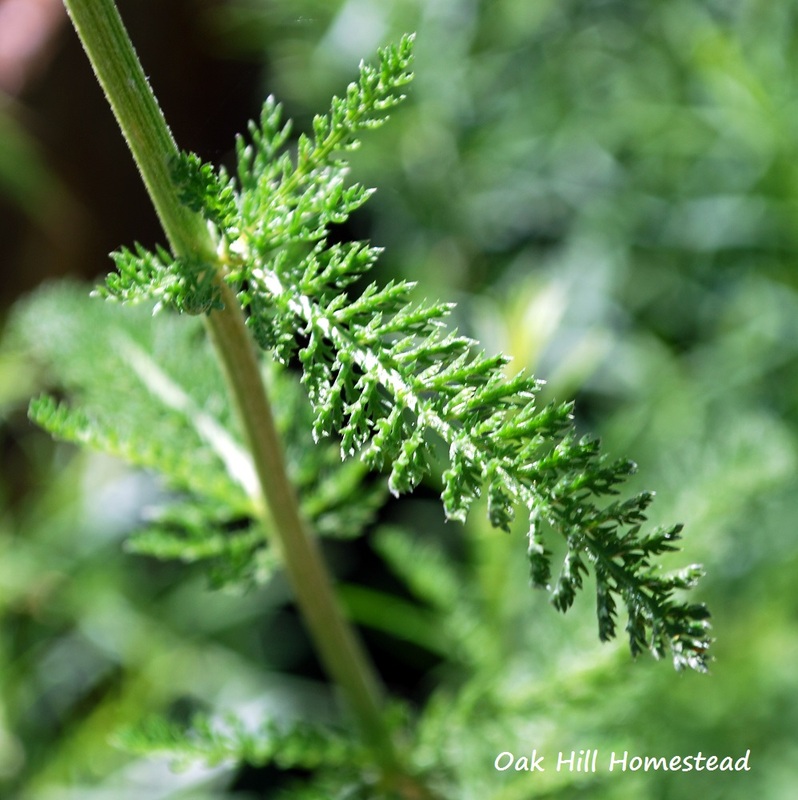 I include yarrow in my all-purpose salve that also contains plantain, chickweed and lemon balm, and use the salve on humans, horses and goats alike. Our yearling filly once cut her forehead deeply, but after using this salve during the healing process she didn't even have a scar. Yarrow is also used as a sleep aid, on rashes and itchy skin, bruises, sprains and swelling, to relieve congestion from allergies and colds, as an aid for eczema and dry skin, and to induce sweating to break fevers. The leaf, flower and stem are used. Yarrow can be used in so many ways, including teas, tinctures, washes, infused oil, compresses, wound powder (made from finely powdered dried herbs), infused in witch hazel as a spray for varicose veins, essential oil, and flower essence. I've just scratched the surface, there is so much more this herb can do. The fresh flowers are a pretty filler in a vase of assorted wildflowers, and the dried flower heads are also quite attractive in the fall. 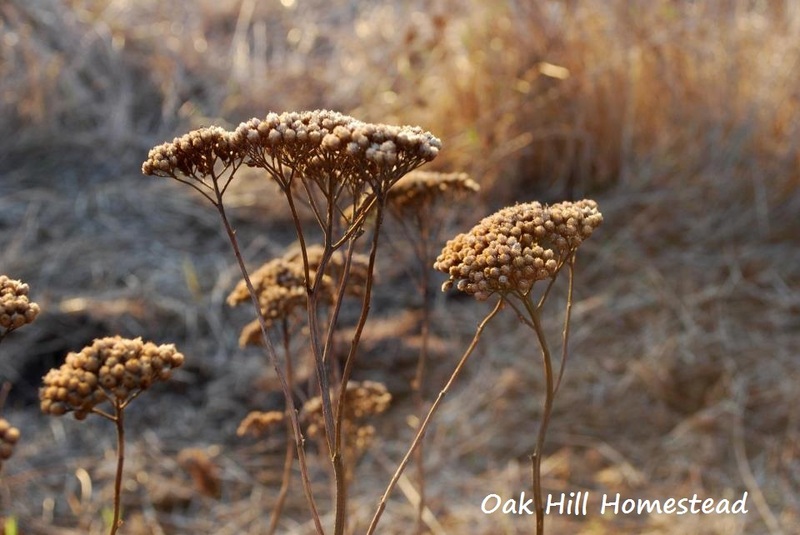 Yarrow seeds are available online. Buy some and plant them in your garden or field to have this beneficial herb close at hand. Remember, before using this or any herb, please research it fully. You are responsible for your own health. You'll find lots of information on using yarrow at Wellness Mama and Herb Wisdom.NOTE: use of yarrow should be avoided during pregnancy. Carra and I are just beginning to learn about herbs and their benefits. We've just started really soap making and are using essential oils in our soaps. It's so amazing the secrets hidden in the Lord's Creation! I'll be browsing your blog and saving info and recipes!! How awesome! I don't think I've ever seen any yarrow out here in our woods, but now I'll be on the lookout. Beautiful photos! It's so good to see you, April! I'm glad you stopped by. The Lord has given us everything we need, but the knowledge has nearly slipped away. I think it's important that we learn all we can, and share that knowledge with others! Thank you, Tammi. Yarrow is pretty easy to spot, especially when it's in flower. It grows in open, sunny places. They are MUCH younger than I was when I first learned to recognize it, about nine years ago. Good for you for teaching them young! I'm curious how you use it to relieve congestion from colds/allergies. Is it just as a tea, or do I have to make a tincture? My son is terribly affected right now and we have yarrow in the yard...he's quite used to herbal teas for other remedies but I have yet to make a tincture. PS: I'm pinning your post so I can remember all of the other uses for it...I have only ever used it for fevers. Thanks for the great info. Great post! I've heard of yarrow and had no idea what it looked like. Now that I've seen it...its all over the place! Thanks for posting such an informative post on this beneficial and beautiful herb. Natalie, Wellness Mama (there's a link at the bottom of my post) suggests using yarrow tea to relieve congestion of colds and allergies. I hope it helps your son. Reduce, Reuse, Renewed - don't you love it when you learn about a new plant and discover it growing all around you?? Thanks, I had missed the link at the bottom completely. I sent him to school this morning with a thermos of tea and will see how he liked it when he gets home. Thanks again for sharing. Great post. 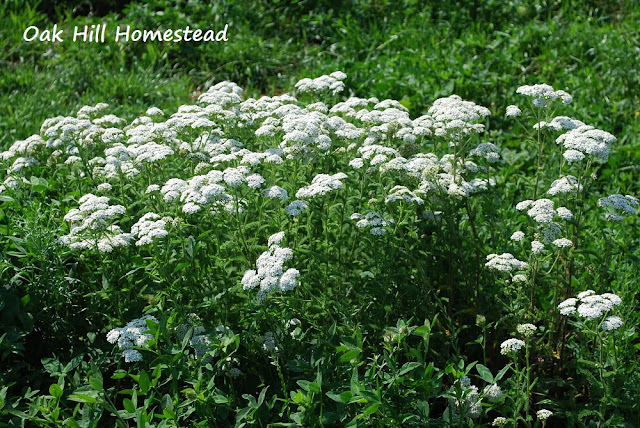 We have yarrow growing across the street from our farm. I use it in our chicken coop to help with respiratory issues and also in flower arrangements all summer. I must dry some to use as a blood stop powder. Thank you for stopping by! I just dehydrated a big batch of yarrow to use as blood stop powder too. I have a horse that is so badly bothered by flies, he gets open sores from their bites. I'm hoping it will help him. I don't recal ever seeing or hearing of yarrow before. I wonder if it grows arund here. Great information. Thanks for sharing! Thank you for visiting, Ann. 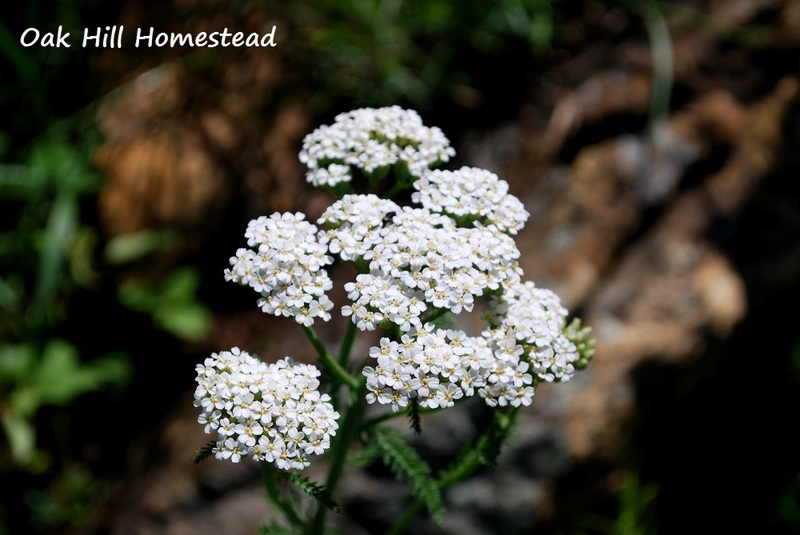 I hope you are able to spot some yarrow growing in your area. It blooms nearly all summer so it's more visible than some other plants. Yarrow has always been one of my favorites and I have some that come up each year but I have never seen all white which is just gorgeous! Stopping by from Tuesdays with a Twist. 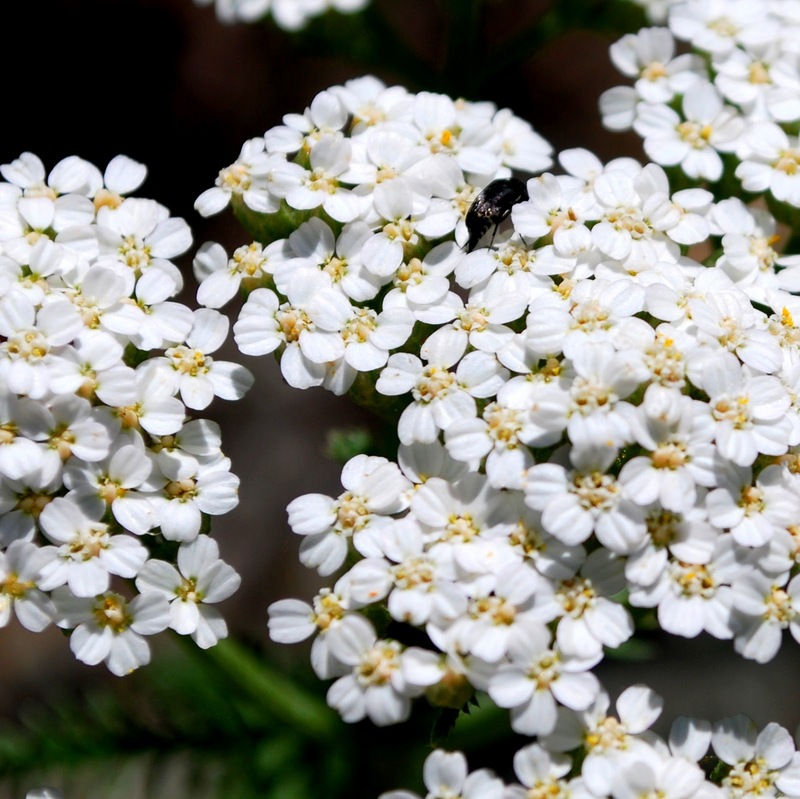 Terri, the white yarrow is said to have the most medicinal value. I'm hoping to encourage some to grow in my herb garden in addition to what grows wild in my pasture. I'm always glad to hear that others are using the wild plants! Such a pretty flower. I think I have seen it before dried, but didn't recognize it with the blooms on! Simply stunning photos, Kathi, and interesting info. Thanks for sharing. Thank you, Janet, I hope it was helpful. I love Yarrow! Thank you for sharing at Tuesdays with a Twist! Hope to see you again this week! I've just harvested an armful of pink yarrow from my yard. I will be using it in my healing salve and making an infused oil for all my other products also. This is my first time harvesting it and preserving it. Do you infuse oil with fresh flowers or dried?and do you use both flowers and leaves together always or do they have different properties? Also, how do you infuse witch hazel? I've only infused oils. Do you start with which hazel from pharmacy with a tiny % of alcohol or use a hydrosol (distillate)? Brenda, I hope you come back and look for a response, since there isn't an email address associated with your comment. I've used both fresh and dried yarrow and other herbs. I prefer to use the fresh herb but if all I have is dry, that's what I use. I also use both the leaves and flowers of yarrow. I've infused herbs in witch hazel from the pharmacy instead of in oil. The procedure is the same. I've also made extracts, which is simply using alcohol such as vodka, and it too is the same procedure.